Barnstorming success during the 2011 holiday season made the timing of this sprawling six-disc set a well-timed retrospective. 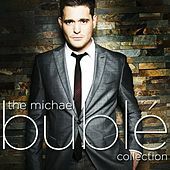 The singer's firecracker update of "Fever" opens things right; like much of what follows, Buble's vocals swing hard and he delivers the classic lyric with just enough edge to engage a modern audience. It can get a bit schmaltzy, for sure, especially with some of the Sinatra standards, but the collection is a worthy endeavor for new fans who are just getting to know the attention-grabbing young vocalist.